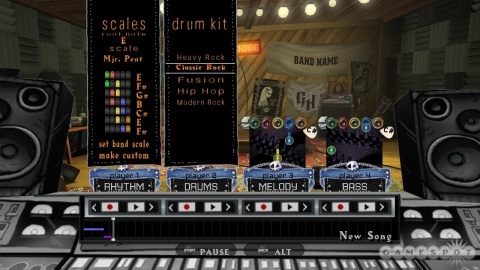 Co-Optimus - News - Harmonix: Guitar Hero World Tour Music Studio "Half-Arsed"
The music studio feature was one of the most highly anticipated things about recently released Guitar Hero World Tour. If you read our review, you know that we found the studio a bit lacking, to say the least. It may not be quite what we were promised, but hey, the competition doesn't have it at all right? Videogamer recently spoke to Rock Band 2 lead designer Dan Teasdale about GH WT's music creation tools. What did he have to say? "We've dabbled around with stuff like that before, with Frequency and Amplitude, and we learned a lot of lessons from it," he said. "The main one is that you can't do it half-arsed. If you want to do a way to let players create and distribute music, you have to go all-in - not just do it as a bullet on the back of a box." He added: "We actually want to find a way to for people to create music and express themselves, but when we do we want to make sure that people can sing, or the songs can be longer than three minutes, or that you can have more than 1200 notes, or that you're not tied to some dodgy sample somewhere. We want to make sure it's an authentic experience and it fits on the platform." File this quote under brutal, but correct. It may be that a solid music creation tool just isn't feasible, given the sue-happy world in which we live in. I'd love to see Harmonix take a stab at it, for sure; maybe they could come up with something whole-arsed!